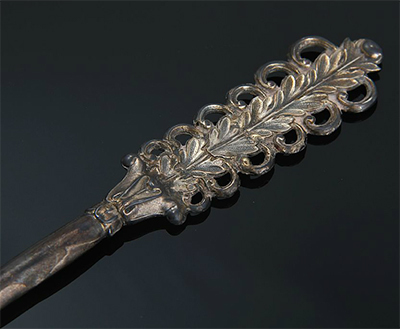 Philosopher Søren Kierkegaard's silver quill, finely wrought as an elegant feather, is being offered by Bruun Rasmussen Auctioneers of Copenhagen in its International Paintings, Antiquities and Modern Art sale on September 18, 2013. It is estimated to sell for €10,000-€13,000 ($13,295 - $17,282). 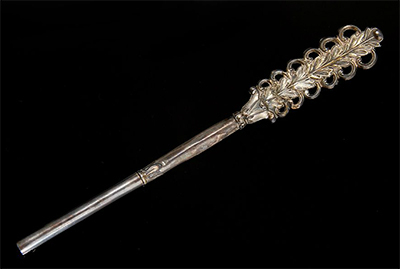 The quill, 16.3 cm long (just shy of 6 1/2 inches), has passed down through the Høyernielsen family, descendants of Kierkegaard's sister, Nicoline. According to family tradition, it is the only pen he is known to have meticulously and diligently used to set down his thoughts, which flooded out of his head, poured down his arm, ran into his fingers through to pen and burst onto paper. In 1955, this pen was exhibited at the Royal Library's Memorial Exhibition on Kierkegaard, and it was also depicted in the exhibition's catalog. Kierkegaard (1813-1855), the father of existentialism who considered himself a Christian poet, was a compulsive, profound and prolific writer with a chronic itch. In 1838, he wrote in his journal, "Ingen dag uden en streg" ("No day without a line"). Later, in 1847, he noted, "Only when I'm writing do I feel well. I forget all unpleasantness and sufferings, I am with my thoughts and happy. If I stop for only a few days I feel immediately sick, overwhelmed, labored, my head heavy and weighed down." "The strange Thinker went back and forth during a silence that was only broken by pen scratching on paper [...] in all rooms lay pen, paper and ink [...] Never in all existence has ink played so great a role." Note that the pen has no nib. By the 1830's, quill pens, which sucked up ink into their hollow via capillary action and required that the feather be often sliced at its point to maintain a sharp nib, had been replaced by dip pens with steel nibs (the pen itself) inserted into pen-holders, as here. 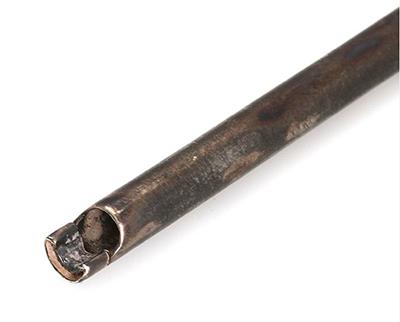 Steel nibs were sturdier, kept their sharpness, lasted longer, and had the added advantage of being a much neater implement, not spilling ink all over paper and fingers. The next step in the evolution of pens was the fountain pen. Had Kierkegaard lived long enough to enjoy their use, the fountain would have required the capacity of Niagara Falls to handle the rush of words that cascaded forth. His pen in overdrive, Kierkegaard wrote seventy-three works during his lifetime, many under pseudonyms including Johannes Climacus, Nicolas Notabene, Vigilius Haufniensis, Frater Taciturnus, Johannes de Silentio, Constantin Constantius, Victor Eremita, and my personal favorite, Hilarius Bookbinder, who, I imagine, thinks that binding a book in infant-soiled publisher's diaper cloth glued with anti-bacterial zinc oxide paste and dusted with Johnson's Baby Powder is a laff-riot. Philosophy being a notoriously low-paying gig, one wonders how Kierkegaard could afford such an extravagant and expensive pen. He was, however, born into wealth and died in it, never held a job, and never, ever had to worry about paying bills, which tends to burn a lot of mental energy that Kierkegaard had the luxury to conserve for that other consuming preoccupation, the anxiety of existence. Images courtesy of Bruun Rasmussen auctions, with our thanks.